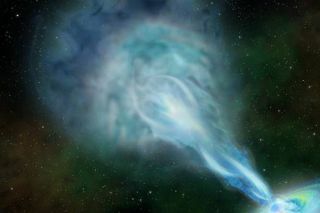 An artist's illustration of a radio jet spewing out fast-moving material from the quasar PSO J352.4034-15.3373, which lies about 13 billion light-years from Earth. Researchers have used two ancient quasars to provide incredible evidence for quantum entanglement. Using two ancient galactic cores called quasars, researchers have taken a massive step forward toward confirming quantum entanglement — a concept that says that the properties of particles can be linked no matter how far apart in the universe they may be. If quantum entanglement is valid, then a pair of entangled particles can exist billions of light-years apart from one another and actions affecting the properties of one particle will affect the properties of the other particle. Albert Einstein described this correlation between particles as "spooky action at a distance." Last year, physicists from MIT, the University of Vienna and other institutions provided strong evidence for quantum entanglement, and now, this same team of scientists has gone even further to confirm quantum entanglement. The distant quasar B1608+656 is smeared into bright arcs by two closer galaxies in the foreground. Researchers have used two ancient quasars, which emitted their light billions of years ago, to provide evidence for quantum entanglement. But there are loopholes in this theoretical limit, in which observations of what seem to be correlated particles have a hidden, classical explanation, the MIT researchers said. One of these loopholes that scientists are working to close is known as the "freedom-of-choice" loophole, or the possibility that an unknown classical influence is affecting a measurement of an entangled particle. With this loophole, researchers observe a quantum correlation when there is none. Last year, this team of scientists demonstrated, using 600-year-old starlight, that if the correlations they observed between particles could be explained by classical physics, this classical origin would have to stem from more than 600 years ago — before the star's light ever shone. To close this loophole even further, these researchers have now used distant, ancient quasars — luminous, energetic galactic nuclei — to see if the correlation between particles can be explained by classical mechanics stemming from earlier than 600 years ago. In other words, they're taking the success of their study from last year and scaling it up to provide further evidence for quantum entanglement. To do this, they chose to use two quasars that emitted light 7.8 billion years ago and 12.2 billion years ago. The researchers used light from these two quasars to determine the angle at which to tilt a polarizer, which measures the orientation of each photon's electric field. They used telescopes located at detectors to measure the wavelength of the entangled photons (light particles) in the light coming from the quasars. If the light was redder than a reference wavelength — a measurement used for comparison that is taken at a different wavelength than those being studied — the polarizer tilted to measure the incoming photon. If the light was bluer than the reference wavelength, the polarizer would tilt to a different angle to measure the photon. In the study performed last year, researchers used small telescopes that only allowed them to measure light from stars 600 light-years away, but by using larger, more powerful telescopes, the researchers have now managed to measure the light from much older, more distant quasars. In studying entangled photons with these ancient quasars, the team found correlations in over 30,000 pairs of photons. These correlations went well beyond the limit set by Bell, showing that, if there were any classical explanation for the correlated particles, it would have to come from before these ancient quasars emitted light — many billions of years ago. "If some conspiracy is happening to simulate quantum mechanics by a mechanism that is actually classical, that mechanism would have had to begin its operations — somehow knowing exactly when, where, and how this experiment was going to be done — at least 7.8 billion years ago," Alan Guth, a physicist at MIT and a co-author of the new work, said in the statement. "That seems incredibly implausible, so we have very strong evidence that quantum mechanics is the right explanation." So, with these findings, it is "implausible" that the measured correlations have a classical explanation, the researchers said. This is strong evidence that quantum mechanics caused this correlation and that quantum entanglement is valid, they said. "The Earth is about 4.5 billion years old, so any alternative mechanism — different from quantum mechanics — that might have produced our results by exploiting this loophole would've had to be in place long before even there was a planet Earth, let alone an MIT," David Kaiser, also a physicist at MIT and a co-author of the study, added in the statement. "So we've pushed any alternative explanations back to very early in cosmic history." The work was published Aug. 20 in the journal Physical Review Letters.